This post was written in collaboration with Israel Tennis Results. Note: The story we’re about to tell is not a new one, but as far as we know, it’s the first time that it was referenced in English-speaking media, and drew a wider audience than the tennis community in Israel. We’re writing this to give a more complete picture than the bits that were published in HaAretz and Jerusalem Post in the last days, which mainly speak about things that occurred this week. Israel’s Fed Cup team has long been a team of two players – Anna Smashnova and Tzipi Obziler, Obziler and Shahar Peer, and in the last few years – Peer and Julia Glushko. Since Israel currently belongs to Zone Group I, it has one Fed Cup tie every year, just after the Australian Open, when 15-16 teams play in four groups, with the winners of the groups contesting for two spots in the playoff for World Group II. Conveniently for the Israeli team, since 2011 the tie takes place in Eilat, the most southern point of Israel. 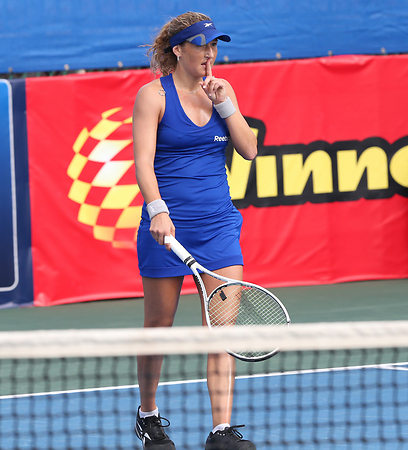 Most unusually for zonal Fed Cup ties, 2013 will mark the third straight year in which Eilat would be hosting the competition, this time – with a 75K ITF event that preludes it and gives the players a chance to practice on the same surface beforehand. The Israeli team in the 2012 tie included Peer (37 at the time), Glushko (211), Keren Shlomo (419) and Deniz Khazaniuk (460). Originally, Valeria Patiuk (646) was also supposed to be on the team, but she got injured a short while before the tie. Israel was drawn in a difficult group, along with Great Britain (the favourite to clinch the first place), Portugal and Netherlands. With Peer in bad shape, which continued throughout the year, the Israelis (effectively Peer and Glushko) managed to beat the Dutch team, but lost to the other two countries and finished in ninth place out of 15. Just two days after the tie finished, the Israeli newspaper “Maariv” published an extensive interview with Khazaniuk, who was invited to be a part of the team for the first time. The interview was filled with criticism - Khazaniuk complained about the ways in which the team conducted itself, their work ethics, the lack of organization by the captain, Lior Mor, the humiliating treatment she got from the other players and their general childish behavior. How did the other tennis players welcome you? Were there things that bothered you about how Shahar and Julia handled themselves professionally? Shahar is actually considered the ultimate pro in Israel. The interview made a lot of noise in the Israeli tennis world, with Khazaniuk being widely criticized for talking to the media about the story, instead of addressing the heads of the Israeli Tennis Association (ITA). Shlomo Tzoref, who was the head of ITA’s professional committee at the time, said two days after the interview that all the complaints Khazaniuk voiced will be checked, but also that she was wrong in the way she handled it. The ITA announced that they will also check Khazaniuk’s behavior, which broke the ethical code and was not accepted for a team player. A week after the incident, Peer and Mor threatened to sue Khazaniuk and the newspaper for libel, and demanded an apology. The issue never made it to court. The next developments in the saga came in October. First, the ITA announced the appointment of Amos Mansdorf as Fed Cup captain instead of Lior Mor. The official reason was the desire to have someone who would be dedicated to tennis, instead of only being available for two weeks (Mor had a different job for the other 50 weeks of the year). Tzipi Obziler, who might’ve been considered a more natural fit for the job, said that she was a candidate, but it didn’t go through because of one of the players on the team. There was further confirmation that the players (Peer, and perhaps Glushko) had a say in the choice of the new captain. At the time of Mansdorf’s nomination, the ITA’s position was that he would be the one to name the team for 2013, and that Khazaniuk would not participate, according to a recommendation of the ITA’s professional committee. In the middle of October, however, the special committee that was nominated to investigate the whole affair concluded that there’s no reason to suspend Khazaniuk, and all she got was a minor reprimand. This was a result of an apology letter which she sent to the committee and to Peer, where she stated that her words were misinterpreted and that she acted out of emotional turmoil. She added that she didn’t mean to hurt Peer and that she was wrong to talk to the press instead of solving the matter internally with the ITA. Credible sources, however, said that the committee (which investigated both sides of the subject) decided not to hand in an official report with their findings – neither external nor internal. Peer herself hasn’t talked publicly about the matter. Glushko (whom Khazaniuk criticized harshly, as well) was asked about it in an interview with Israel Tennis Results and claimed that none of what Khazaniuk said was true and that she didn’t have anything else to say to her. At any rate, a well-informed source said that there isn’t a chance of Khazaniuk playing for the team as long as Peer and Glushko are there. This week, Khazaniuk and Peer were slated to meet in the semifinals of the Israeli Championships, a tournament which Peer won seven times before. Peer won emphatically 6-0 6-1, and followed the win by making a ‘silence’ gesture towards her opponent, refusing to shake her hand and shouting that she’s a “disgrace to the State of Israel”. Khazaniuk responded after the match, saying, “I understand that she’s angry. I saw it coming and I’m not upset. She told me in the end that I’m a disgrace for the country, I didn’t reply and it probably stemmed from anger, I’m not judging her”.